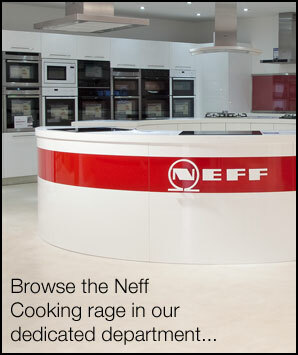 Stellisons Electrical teamed up with Neff to launch the stunning Taste Kitchen - Suffolk's newest cookery space to host your cooking events and cookery schools to budding chefs and cooks alike. We have a huge car park for your cooks, with the Taste Kitchen based as part of the Stellisons Megastore in Ranelagh Road, Ipswich. This exciting state-of-the-art cookery school offers much more to your cooks than your run of the mill cookery schools spaces, with the ability for real ‘hands-on’ teaching in a fun and huge environment, not to mention some of the most advanced kitchenware available today. It’s available to run half days, full days and evenings courses so they appeal to everyone’s time and budget. With the potential to book out long-term scheduled courses you can tailor the Taste kitchen to suit your cookery school’s workflow. We've already had many successful years at the Taste Kitchen with lots of exciting courses and events - from ‘nose-to-tail’ Butchery classes, how to bake and decorate fabulous cupcakes, mastering some of the most colourful Thai, Indian and Middle Eastern Dishes, British Classics, Fish Courses and even Beer Tasting with one of only 30 beer sommeliers in the country! The Taste Kitchen has welcomed some fantastic guest Chef’s too, appearing at the Taste kitchen to teach some of their best kept secrets. If you eant to take advantage of this amazing cookery school kitchen call us or email us at the Stellisons Ipswich Store and ask for Matt who will be more than happy to answer your questions or give you a tour of the facilities and discuss bespoke plans to suit your cookery school or cooking event.